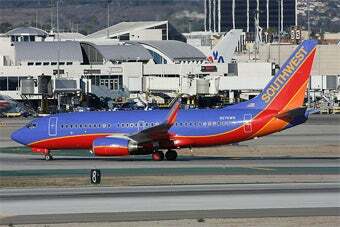 A Southwest Airlines flight attendant took custody of a child after her mother slapped her because the girl wouldn't stop crying. God, what is going on with flights these days? It's like the Wild West out there! Just days after Steven Slater made headlines for flamboyantly abandoning a JetBlue flight, flight attendant Beverly McCurley issued her own brand of frontier justice and took an 13-month old away from her arguing parents. Apparently, on a flight to Albuquerque, the child started crying which started a fight between her parents. Several passengers and McCurley saw the mother Lee Ann Cid, strike her daughter in an attempt to stop her crying. McCurley then intervened and took the child from the couple and walked to the back of the plane, although she later gave the child back to her father, and he managed to get the baby to fall asleep. The parents were met by police at the Albuquerque airport, but were released and allowed to continue to their final destination without any charges filed. Damn, we don't know which is worse, parents hitting their kids in public or flight attendants empowered to play Department of Child and Family Services while in the air. One things for sure—we're booking Amtrak!